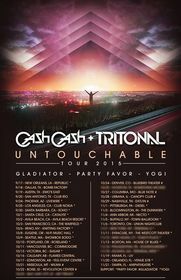 Tritonal & Cash Cash "Untouchable"
Two of dance music's rising favorites Cash Cash and Tritonal raise the bar on touring -- announcing an incredible three-month joint "UNTOUCHABLE TOUR" across the length and breadth of North America. Kicking off on September 17th in New Orleans, LA and peaking in Tampa, FL on November 21st, the Cash Cash & Tritonal UNTOUCHABLE Tour will take Jean Paul Makhlouf (Cash Cash), Alex Makhlouf (Cash Cash) and Sam Frisch (Cash Cash), Chad Cisneros (Tritonal) and Dave Reed (Tritonal) across San Francisco and Seattle on the West Coast to New York City, Boston and Miami on the East, hitting almost every single major city in between. "We've been wanting to do a full US run like the UNTOUCHABLE TOUR for quite some time," tells JP Makhlouf. "Clubs and festivals are amazing but it's always fun to go city by city, night after night in a bus hitting all the places we don't normally get to play when we're on a fly out schedule. That being said, we're thrilled to embark on this journey with our good friends Tritonal. Our styles fit together really well and doing a song/tour together makes perfect sense. Mark your calendars and come get wild with us!" "The UNTOUCHABLE TOUR is hands down the largest and most extensive American and Canadian tour that we've ever embarked on," said Cisneros, one half of Texan-based duo Tritonal. "There have been so many countless hours in the studio leading up to this point, and we can't even express how excited we are to play all the new and old Tritonal records across all of the cities. We couldn't pick a better bunch of guys than Cash Cash to jump on a tour bus with. Let the craziness begin!" After their collaboration "Untouchable" scaled the heights of the iTunes and Beatport charts last month, it should come as no surprise to fans and industry insiders alike that the two groups have chosen now to join forces. Both have made serious in-roads establishing themselves as frontrunners in the new generation of homegrown talent and both have scored multiple hit records -- Tritonal with an impressive three Billboard Top 10 Dance Chart hits to their name in only the past 12 months while Cash Cash clocked up over 48 million Spotify streams and 15 million YouTube views for hit single "Take Me Home" ft. Bebe Rexha. An internationally praised electronic act, Cash Cash, comprised of best friends and brothers (Jean Paul Makhlouf, Alex Makhlouf and Samuel Frisch) are hailed for their infectious dance-pop original tracks, vibrant remix productions as well as their energetic live DJ sets on festival mainstages and clubs spanning across the globe. Cash Cash emerged from the start with global recognition and support from renowned DJs and peers, including Tiesto, Hardwell, Zedd, Nicky Romero, captivating dance music insiders and friends along the way. Their hit song "Take Me Home" featuring Bebe Rexha has gathered over 50 million Spotify streams, over 20 million YouTube views, and Gold certification in the United States; while latest single "Surrender" has peaked at #36 on the Top 40 chart, the trio's second #1 song on dance radio. Currently in the studio working on new music, the guys are working with Busta Rhymes, Fitz & The Tantrums, Capitol Cities, Christina Perri, and more. Texan duo Tritonal have come a long way since 2011's explosive debut album 'Piercing The Quiet' produced eight Top 20 Beatport hits -- including an impressive five genre #1s. Chad Cisneros and Dave Reed's swift rise has seen them build the leading Enhanced Music imprint with Will Holland, demolish the global festival circuit, establish a huge Vegas residency at Marquee, sell over 100,000 units of their globally acclaimed Metamorphosis EP series and launch their Tritonia radio show, consistently ranked as one of the Top 10 music podcasts on iTunes. Supported by the planet's biggest artists -- Armin van Buuren, Above Beyond, Tiesto, Hardwell, Dada Life, Nicky Romero, Ferry Corsten and Pete Tong among them -- Tritonal were hand-picked by MTV for their 2013 '10 Artists To Watch' list. In the past year alone the pair have amassed three Billboard Top 10 Dance Chart hits, scored an iTunes Dance Chart Top 5 with their Tritonia compilation, remixed for Hardwell, Zedd, Armin and Adam Lambert, deal with a tour diary more packed than the departure board at JFK International and in between all that, found time to go into the studio to work on a brand new album, penciled for release early 2016.